I’m a big fan of fruit crisps since they’re so easy and delicious. Here is my healthy rendition of a fruit crisp. Enjoy! Place apples and cranberries together in a 2-quart square baking dish. Combine all of the rest of the ingredients together to make the topping. Mixture will resemble coarse crumbs. Sprinkle this topping over the fruit. Bake in a 375f oven for 30-35 minutes or until the fruit is tender and the topping is golden. Variation: if you’re short on time, just use a can of pie filling in place of the fruit and put in the oven on your “broil” setting for a few minutes until bubbly and golden brown. Watch it–it won’t take long to warm through! 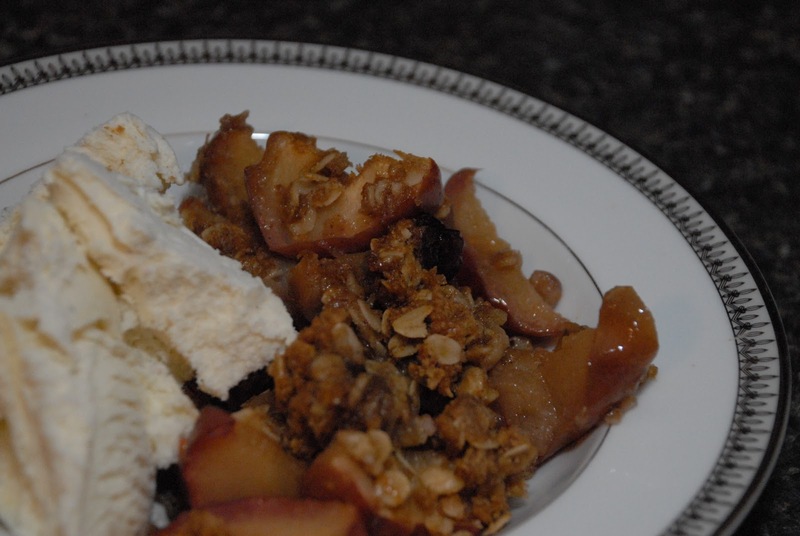 There is a misprint in the Apple Cranberry Walnut Fruit Crisp recipe. It had me a little confused for a minute! It reads: 1/4C four and 1/4C flaxseed meal; it should read: 1/4C FLOUR and 1/4C flaxseed meal. If anyone put four 1/4 C flaxseed in it they were either quite puzzled or had a heck of a bellyache! Flaxseed is great. I use that on cereal that doesn't have much fiber in it; ther's not a lot of taste to it- just a little crunch. I have a gas problem when I use the flaxoil pills as a supplement. Was my 1st comment received? I sent it just prior to the one just sent. It was my input on the “Life More Simply” site; today is my 1st day on it. I mentioned that I had 4 grandkids, etc. I'm having to “enter” 3 times. I know for sure the 2nd one went through. With the 1st one, however, I did not have to type in a keyword at the bottom before it went through- IF it did. Please let me know.